The 41.6 metre sailing yacht Infatuation, listed for sale by Tim Quinlan and Marc Haendle at Ocean Independence, has had a further €550,000 price reduction. Designed by Tony Castro, Infatuation was built in steel and aluminium to Lloyd's class by Dutch yard Jongert and delivered in 2004 with accommodation for up to nine guests in four well appointed cabins. The full-beam owner’s suite has a large seating area and stunning, bright en-suite bathroom. Further guest accommodation is provided by a double and two spacious twins, one with an additional Pullman berth. All cabins on this yacht for sale have large en-suite bathrooms. She also boasts the Jongert patented folding keel that allows her to reduce her draft from 5.1m to 2.75m, making her the perfect choice to reach shallow anchorages. This yacht for sale was designed with an excellent combination of indoor and outdoor dining and lounging areas. The main saloon, decorated by Peter Sijm, is large and elegantly understated with a formal dining area to one side and relaxing lounge seating to the other. Leading out onto the main deck there is another well appointed lounge area and an aft deck al fresco dining space. A large sail plan integrates an in-boom leisure furling system while, under power, a 650hp MTU engine allows for extended cruising at a speed of 10 knots with a range of 2,400 nautical miles. 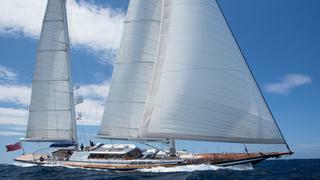 Lying in Gibraltar, Infatuation is now asking €2,350,000.